As we publish this article, all the preparation at CIDCO exhibition, Centre will be in final stages. 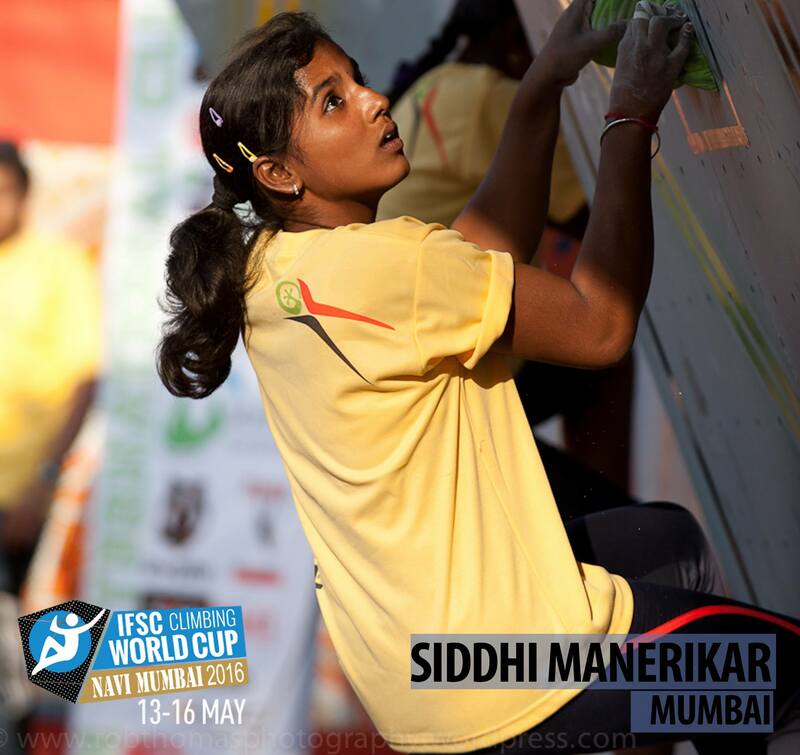 From tomorrow, Climbing World Cup begins in Navi Mumbai. With this article we bring you top women climbers from India who will be participating in this edition of WorldCup. Siddhi Manreikar – During teenage years when girls get fascinated by Hannah Montanna and other Disney characters, Siddhi got fascinated by the Climbing wall at her school. She started practicing regularly at School and with support by parents and teachers she kept on participating in many climbing competitions and won many of them. She is also among top favorites for this year competition. She considers her mother to be the main pillar of strength and confidence. She recently won bronze medal in National Bouldering Championship held in November 2015. 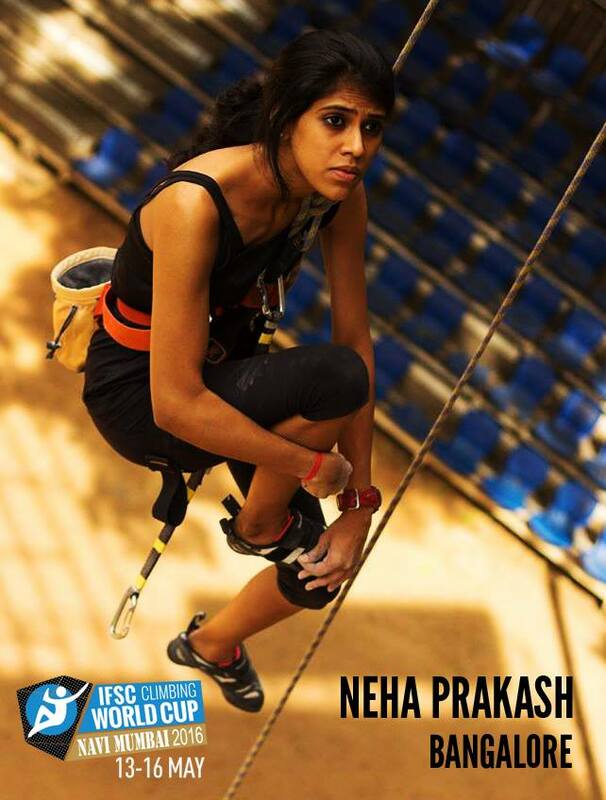 Neha Prakash: She is from the Climbing hub of India – Bengaluru. She discovered climbing way back in 2006 and since then her journey has nothing been short of a revelation itself. Neha is among the most popular Climbers in the Country. She has won several climbing competitions including Lead Climbing Asia Youth championship in Kazakhstan in 2009. She is among the rare breed of multi talented people who are not only master in one activity but are master of many things. Yes, Neha is master at Dance, Swimming and Taekwondo. Sonali Pereira: From Climbing Trees in childhood to being a National Champion in 2012, Sonali has proved she is a force to reckon. She is a regular participant in most of the competitions and with her flexibility she has won many medals too. She loves all kinds of adventure sports like kayaking, Wind Surfing, Rafting but Climbing has been her most favorite sport. She currently resides in Bangalore and is an alumni from Mount Carmel College, Bangalore. Dhanashri lekurwale: Her instagram profile says “Not just Another Trekker. I travel, I climb”. She is straight to the point and doesn’t take anything lightly. Her training schedule is one of the hardest and strictly follows all activities and diet plans to remain upbeat. 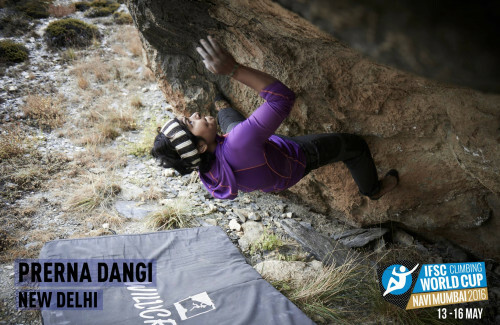 She is relatively new and has immediately made her mark on Indian climbing by achieving 2nd and 7th positions in Zonal Bouldering Competition and IMF’s national Competition. Dhanashri is from Pune and loves trekking. PSNOTE-not just another trekker. Prerna Dangi – Prerna is alumni from Prestigious St. Stephen’s, Delhi. It was here she got introduced to artificial wall climbing and never looked back. She went on to climb several peaks in Jammu & Kashmir, Himachal Pradesh, Uttrakhand and several other places. In the artificial climbing scene, she has done several tough routes in 5b to 6c grades. In 2013, she won prizes in all categories of climbing in North Zone competitions – 1st in Speed, 1st in Boulder and 3rd in Lead. She has also won at many other competitions and is favorite in coming world champions too. Mayuri Deshmukh: Mayuri is from Pune and is currently pursuing Arts from Modern College, Pune. Her love for climbing started when she visited Satarkars to climb in their artificial wall set up in their hall. Satarkar thought she is also like other students who come with a fire but disappear like a smoke. But he was wrong. Mayuri’s burning passion for climbing just went on increasing. She went to Satarkar’s again and again. Soon she started practicing along with boys and also gave them tough competition in workouts too. Yeah she can do 50 pushups and 25 pull ups at one go. 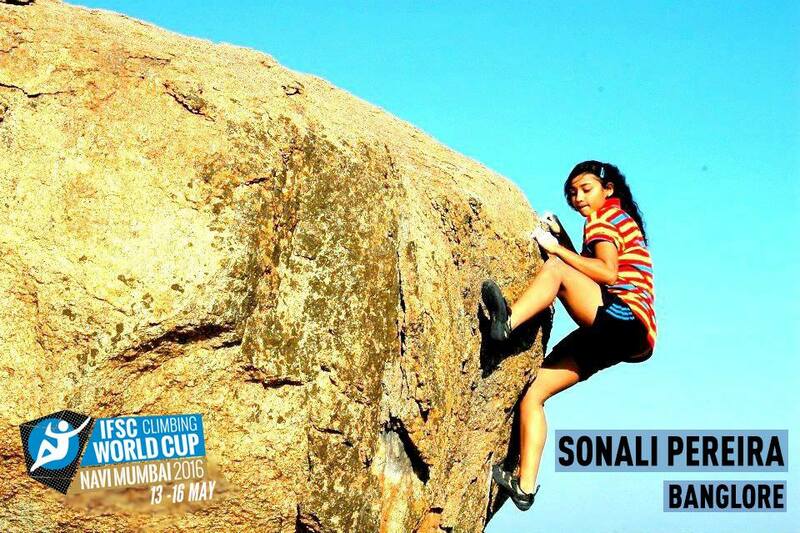 Last December she won gold at National Sports climbing competition in Kolkatta. 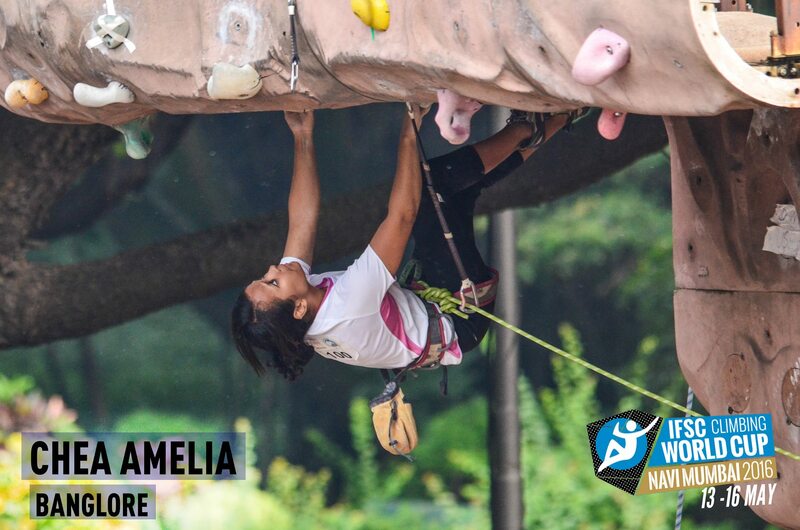 In 2014, she won gold in Singapore’s Boulderactive event. Smriti Singh: Smriti popularly known as Sam. She was introduced to adventure sports by her mother. How cool is that. The coolness is still not over yet. Sam is a professional Bartender and Flair artist she is also founder of The Bar Code which aims to educate people on alcohol consumption. 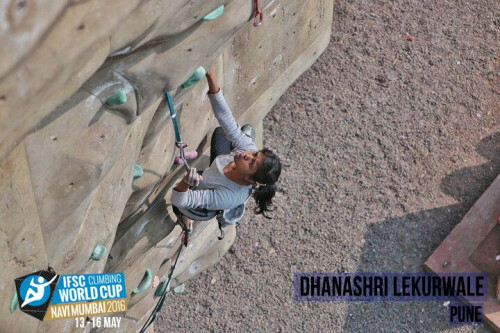 Coming back to climbing, she came in third at 21st National Sports Climbing Championship in 2015 in Speed event. In 2014, she stood 3rd in South Zone Bouldering competition. She lives in Bangalore and you will often find her Rock Climbing in Hampi and Badami. Chea Amelia: She has represented India in Asian Youth Sport Climbing Championships in Kazakhstan (2009), Singapore (2011) & Iran (2012). 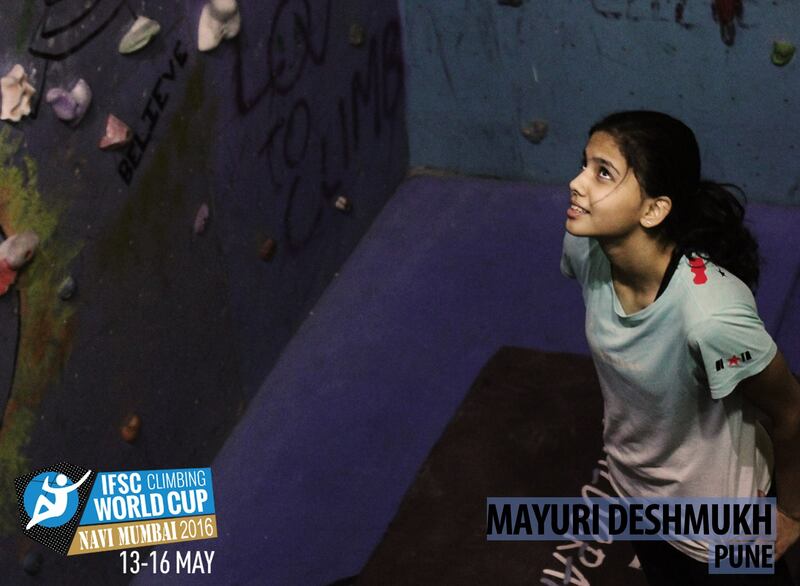 In last National Championships in Dec 2015, she had podium finish in all Lead, Speed and Bouldering events. She is aptly named ‘Chea’, which means ‘Victory’ in the local language of Meghalaya, You will often find her practicing her moves at the Equilibrium Climbing Station in Bangalore under the guidance of her coach of 10 years Keerthi Pais. With 4 hours of climbing everyday and some cross training, Chea is getting ready to tackle the big problem. 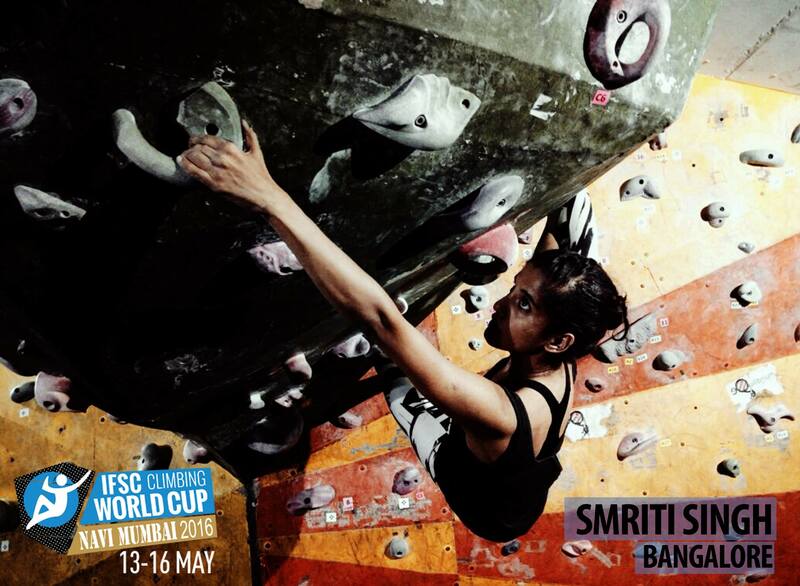 We Invite all you to come to Navi Mumbai and witness these superwoman’s scale new heights and make India Proud.